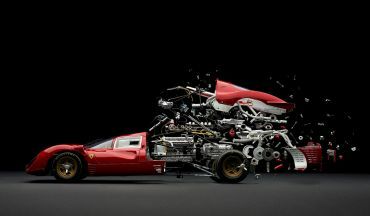 Only here you will see great pictures of classic sports cars such as the Mercedes-Benz 300 SLR (1954), Ferrari 330 P4 (1967), Jaguar E-Type (1961) and other cars, exploding in the air, or "born" into the world. Working on this exhibition of Swiss photographer had to be patient, because in order to create the illusion of the collapse of the car on the side, he analyzed a small copy machines to thousands of small details and pictures of each of them are set out in a premeditated place by the thinnest needle and wire. 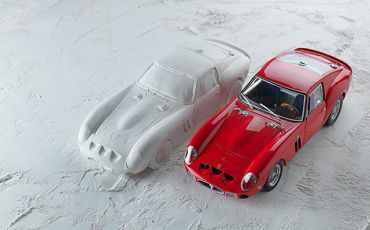 In addition, the exhibition cycle «Hatch», which translated means "hatch" will present to your attention the model of the Ferrari 250 GTO, which was recognized as the best machine 60s. The artist wanted to show that mechanical products can also "born" as a living being. 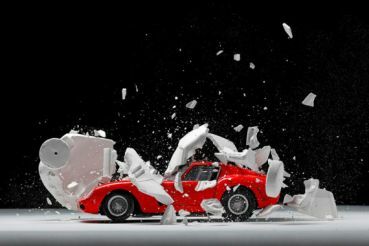 So he created a latex mold model racing car, which filled a thin layer of plaster to obtain a "shell" and then this "shell" he threw on top of the model - the plaster from the impact began to crack and fly apart, thereby creating the illusion of the "birth" of the vehicle " shell. " Of the hundreds of images obtained Fabian Ofner selects the best, combines them into one masterpiece using a graphical editor and done only after the "jewelry" work, you have the opportunity to see these pictures is amazing. 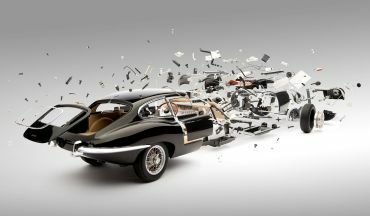 "Scattered" Fabian Ofnera cars waiting for you! Do not miss this exciting event to be held in the beautiful Swiss city of Geneva.